Above image courtesy of Hans Grimm. Though I’ve travelled by plane a countless number of times, air travel never ceases to amaze me. You step into an airplane and a few hours later, you arrive in a different city, country, continent. With the convenience of travelling by air and the ease and affordability of communication today, the world seems to be a lot smaller than just a few decades ago. 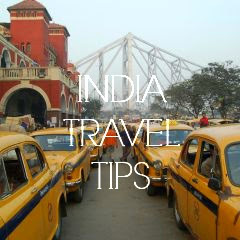 Today most travellers to India arrive by plane. But during the late 1960s and 1970s, the only way to travel to India was overland! Sure there were flights to India, but most travellers preferred the overland route from Europe, passing through Western then Eastern Europe, then Turkey, Iran, (sometimes taking a detour into Syria and Iraq) Afghanistan and Pakistan before arriving in India and often continuing on to Kathmandu, Nepal. These adventurers made the 12,500 km trip in converted London taxicabs, fire trucks, double-decker buses, Royal Mail vans, or brightly painted buses and VW vans. Though they often had a fixed travel itinerary, they rarely had any set plans, little luggage and very little money. In 1973, the travel company Intertrek offered a 3 1/2 month trip from London to Kathmandu for £280. In 1974, a one-way trip to Delhi from London cost £50 with Budget Bus while Magic Bus offered a non-stop 4-day trip from Amsterdam to Delhi for $45. A one-way trip from London to Kathmandu with Swagman Tours travelled through 15 countries and took 76 days. 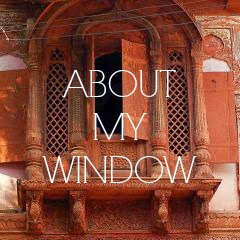 I love to hear about what it was like to travel overland during this time and why young people were so drawn to India. My mother-in-law who was 24 in 1968 loves to tell me about her hippie days so I asked her if she knew of anyone who had travelled overland to India. She said that although many of her friends had talked about it, she had only heard of people who had made the trip. She explained that rejecting a career and travelling to Asia without money was a way for young people to rebel against their ‘bourgeois’ upbringing. “Drugs were also a very big part of it,” she confirmed. My artist neighbour in Brussels told me that in his youth he would spend months at a time in India and Sri Lanka, painting. When I asked him how he used to travel there, he said mostly by hitchhiking and sometimes by bus. Then there’s the mother of my friend Lisa who bought an old taxicab in London and drove across Asia in it! In a fascinating book by Rory Maclean, The Magic Bus: On the hippie trail from Istanbul to India, the author retraces the overland trip to India made by hippie travellers in the late 60s and 70s. He explains how a whole generation was inspired to make the trip thanks to Jack Kerouac, Allen Ginsberg and the other ‘Beats’, as well as the Beatles. On the Road by Jack Kerouac (published in 1957) seems to have sparked the wanderlust of this generation. A recent book, Deborah Baker’s A Blue Hand: The Beats in India narrates Ginsberg’s and some of the other Beats’ travels through India in the early 60s. With the 1979 Iranian revolution, the overland hippie route was definitively closed. This unique travel adventure was experienced by only one generation. Very few make this trip overland today. Though travelling through Iran is now feasible, this may be more of a challenge in Afghanistan and Pakistan. 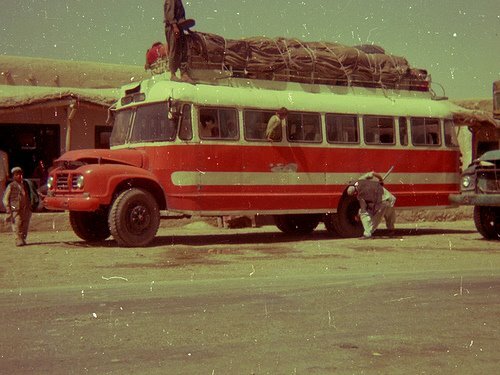 Click here for an account of a 1973 overland trip from London to Kathmandu. Photos taken in 1975 during an overland trip to India by Hans Grimm. 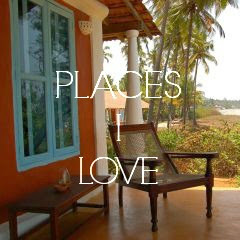 See also this site: India Overland.